France is one of the top tourist destinations in the world. It has everything that you could ever want to see on your holidays: a great city like Paris, good beaches, more monuments than any other country, lovely nature, incredible mountain scenery, and let’s not forget amazing food and great wines. 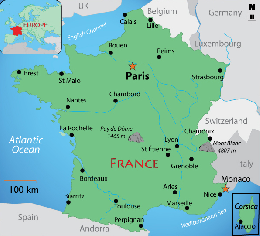 It is divided into 7 main cultural regions: - The Ile de France is the region surrounding the Paris. - Northern France consists of the flatlands and includes the cities of Nord-Pas de Calais, Picardie, and Haute-Normandie. - Northeast France produces many famous wines. It includes Alsace, Lorraine, and Franche-Comté. - The Great West is an oceanic region, with a culture greatly influenced by the ancient Celtic peoples. It includes Normandy, Brittany, Pays de la Loire, Bordeaux, Pays Basque, and Biarritz. - Central France is a largely agricultural and vinicultural region. It includes Centre-Val de Loire, Poitou-Charentes, Burgundy, and Auvergne. - Southwestern France is a region of sea and wine, with nice beaches over the Atlantic Ocean. It includes Aquitaine and Midi-Pyrenees. - Southeastern France has a warm climate and azure sea. It includes Rhône-Alpes, Languedoc-Roussillon, Provence-Alpes-Côte d'Azur and the Mediterranean island of Corsica.